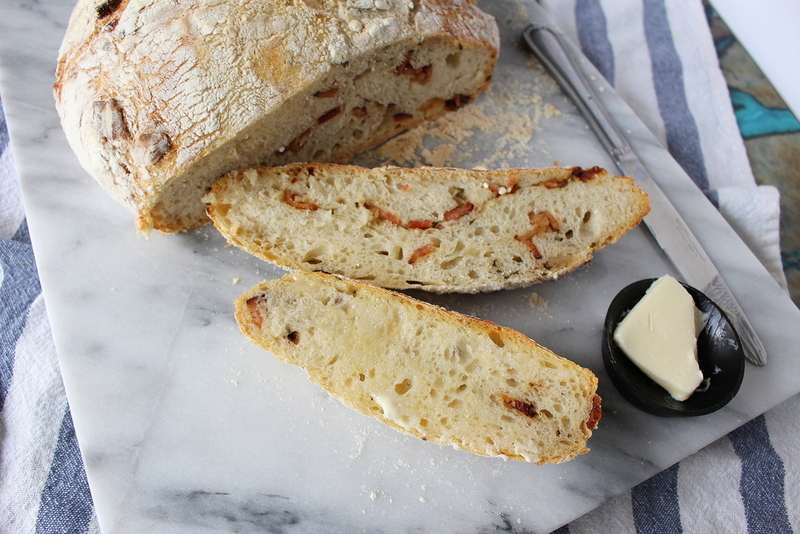 Say hello to one of the easiest, yet amazing, breads I have ever baked. I'm making it again this weekend, it's that good. 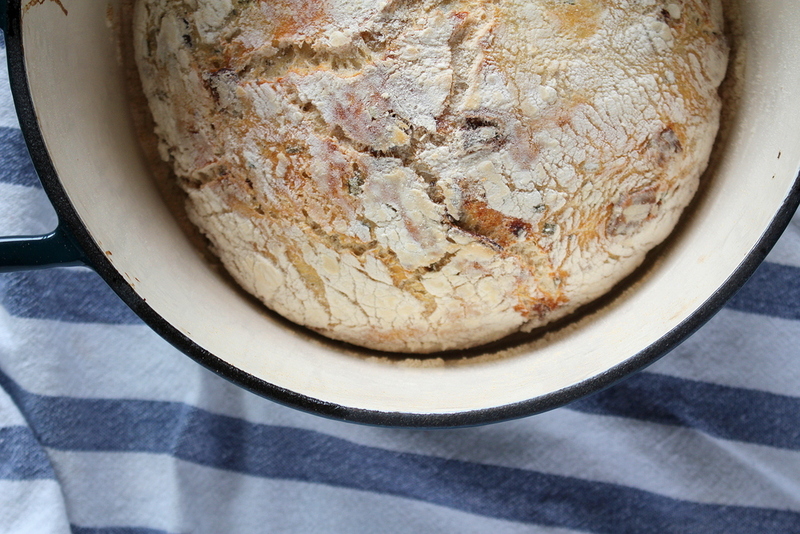 It's the kind of crusty bread that is perfect for soup dunking, or simply covered in butter. I've been in full blown autumn-mode lately, and I have absolutely no shame about it. I think I always get prematurely excited for fall because it's my favorite season. We had a ridiculously hot summer for us, and by mid-August I was done with the heat. I'm making something with pumpkin on Friday, but I will wait a couple weeks before sharing it with you guys. But, back to this fabulous bread. If you have never baked bread before, don't be nervous about it! I'm not the most experienced bread baker, and this bread came out perfectly for me. It is so, so easy. The dough has to rise for at least 12 hours, I started mine the night before and baked it the next morning. The dough will be sticky, which is perfect. After rising, stir in the chopped bacon and chives. Then you let it rise again, plop into a hot dutch oven, cover and bake. My apartment smelled like bacon bread heaven. Can we just admire those chunks of crispy bacon? Ugh. 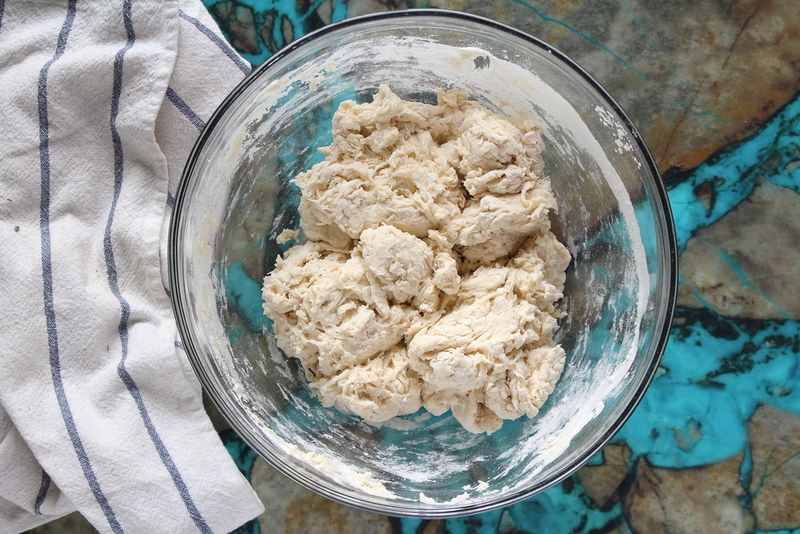 In a large bowl, combine 3 cups of the flour, yeast, and kosher salt. Stir in the warm water until combined, the dough will be really sticky. Cover the bowl tightly with plastic wrap, and let rise over night, about 12 hours, or longer if you want. The next morning, cook the bacon until crispy. Save some of the bacon grease for brushing. Drain the excess fat from the bacon pieces, and roughly chop it up. Sprinkle the bacon and chives onto the dough, along with a good dose of fresh ground black pepper. Mix it a few times until it is incorporated. It doesn't have to be perfect, just be sure that not too many bacon bits are poking out of the dough. Lay down a clean kitchen towel and place a piece of parchment paper on top. Brush the parchment paper with a thin layer of the bacon grease, then lay down a thick layer of flour, about 1/2-3/4 cup. Scrape the dough onto the floured surface, and using heavily floured hands shape into a round-ish shape. Sprinkle the top with another thick layer of flour, brush another piece of parchment with bacon grease, place on top of the dough, and cover everything with another towel. Let the little guy rest for another 1 1/2 hours. During the last 1/2 hour of rising time, preheat your oven to 450 degrees F, with a lidded dutch oven in it. I used a 5 qt dutch oven, you can certainly use a smaller one if you have it. Carefully remove the dutch oven and take the lid off. Uncover your dough, stick your hand underneath it and flop it into the dutch oven. Put the lid back on and bake for 30 minutes. Remove the lid and bake for another 15-20, until the top is golden brown. It's best to let it cool for about an hour before slicing. But I have the patience of a two year old and let it cool for about 20 minutes and it was fine.